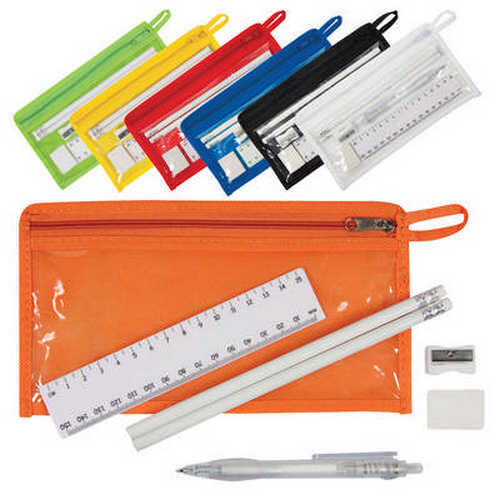 Zipped non woven Pencil Case with clear PVC front. Ballpoint pen. Two HB pencils with erasers. 15 cm ruler. Eraser. Sharpener. Product Size: Pouch 220 x 120mm. Product Packing: Bulk packed. Decoration Size: Pouch 150 x 50mm, Ruler 60 x 10mm, Pen 40 x 6mm, Pencil 60 x 4mm. Decoration Position: Front of pencil case, pen, pencils or ruler. Decoration Method: Screen Print. Carton Quantities: 500. Carton Size: 70 x 48 x 35. Carton Weight: 28. Colour: Black | Blue | Lime | Orange | Red | White | Yellow. Price includes : Screen Print 1 Colour / 1 Position. Setup is included.